-12 small/medium potatoes (use the week 17 and 18 pictures for size reference.) They yielded about 6 cups diced. -1 medium white or yellow onion, diced. -3.5 cups of low sodium chicken stock. I like Kitchen Basics’ unsalted variety. -3 cloves of garlic, minced. -Peel and quarter-inch dice your potatoes. If you too are sick with the stomach flu, have a friend drag a chair and your laptop into the kitchen so that you can sit and watch bad reality television like Hell’s Kitchen while you work. If you’re preparing them in advance, put the diced potatoes in a bowl and cover with cold water. This will keep them from turning gray. -Dice the bacon and sauté it to render out most of the fat. -Put the potatoes, chicken stock, bacon, thyme, pepper, and some salt into the crock pot and set it on high. -Gently sauté the onions in the left over bacon fat (you may need to add a splash of olive oil) until translucent and fragrant. Add the garlic and sauté 1-2 minutes more. Add this to the crock pot and give everything a quick stir. -Cook on high for 4 hours. -Garnish with green onions and a few grinds of black pepper. Eat merrily. It’s so good. I confess, however, that by the end of the weekend I was really tired of the lack of solid food in my diet. 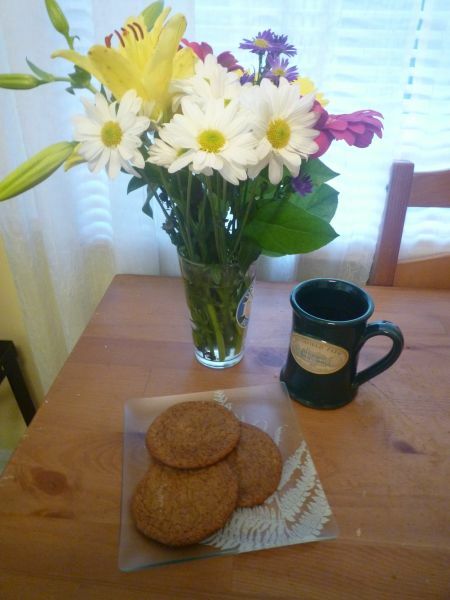 I made cookies and justified it by saying that the inclusion of ginger (digestive aid!) and blackstrap molasses (iron!) made them an appropriate snack. And they’re perfect autumn cookies, best eaten alongside a strong cup of coffee. -Pre heat an oven to 350 degrees F.
-Mix the flour, cinnamon, ginger, allspice, baking soda, salt, and pepper in a bowl and set aside. -Cream the butter and ½ cup of the sugar (reserve the rest in a small bowl) until fluffy. Add the egg and molasses and mix well. -Slowly add the dry ingredients to the wet and mix until just combined. -Line two baking sheets with parchment paper and drop the dough by rounded tablespoonfuls onto the baking sheets. They will spread slightly, so only put 7 cookies on each sheet. -Spray the bottom of a glass with non-stick cooking spray, dip in the bowl of reserved sugar and then flatten a mound of dough. Repeat for each cookie. -Bake for approximately 13 minutes or until just set. The centers will still be slightly soft, but will firm up and be crunchy once cooled. -Cool on a wire rack and then store in a sealed container for up to a week. But they won’t last that long. Onto this week’s Mystery Food…I called this week the clown box edition for good reason. Items just kept coming out no matter how many times I reached into the box! Fantastic. 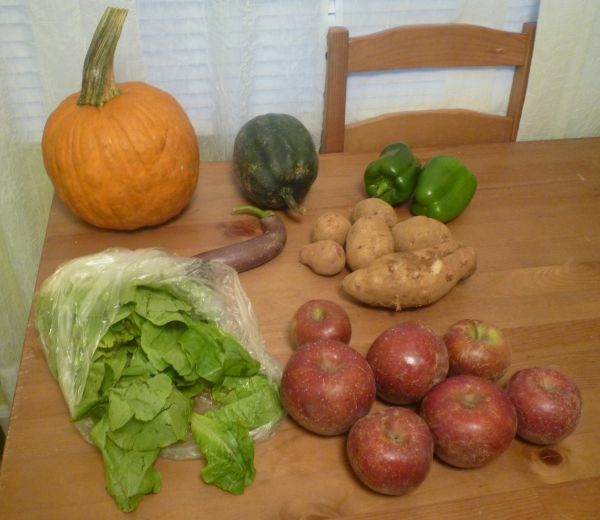 Salad greens, Rome apples, green bell peppers, a small eggplant, squash, potatoes, and a lovely pumpkin. I found a recipe for sweet spiced pumpkin pickles so I might give that a go. If I end up canning I might also use some of those beautiful Rome apples to make apple pie filling. A quart jar of pie filling is the perfect amount for a 9-inch pie. I hope you enjoy this week’s recipes. I’m crossing my fingers that my stomach and I can form a peace treaty so that there will be apple-picking in the near future. What better way to celebrate autumn?